Tomato plants fall into two main categories: determinate and indeterminate. Determinate tomato plants are compact in size and produce fruit and then die back. Indeterminate tomato plants grow taller than determinate plants and continue to produce fruit throughout the season. Tomato plants may also be hybrid or heirloom plants, and all heirlooms are indeterminate. 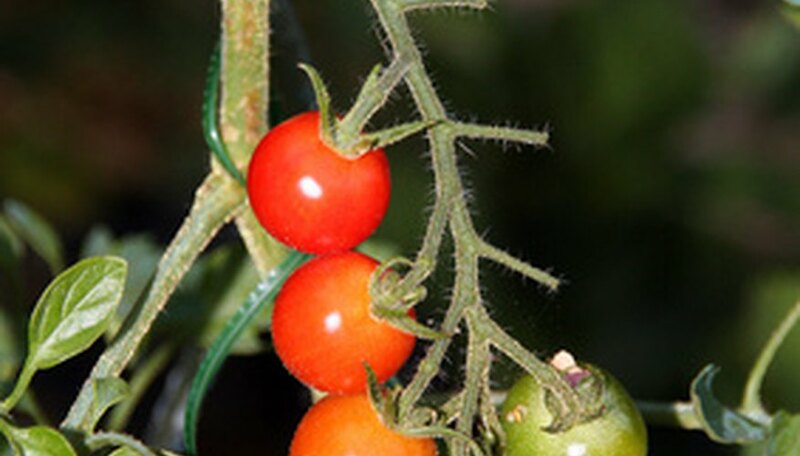 Cherry tomato plants are indeterminate, producing clusters of small, cherry-shaped tomatoes. These tomatoes are sweet and may be added to stir-fries or salads. Paste tomato plants, also indeterminate, produce clusters of pear- or oblong-shaped tomatoes. Paste tomato plants include Roma, Italian Gold, Early Cascade and Black Prince. These tomatoes may taste more acidic and are commonly used to make tomato sauces and paste. The cross pollination or genetic manipulation of seeds results in a hybrid variety of tomato plant. The Early Girl tomato seeds were developed in the 1970s with the intent to produce a plant that would provide tomatoes early in the growing season. The modern Early Girl variety, an indeterminate, matures in 50 to 60 days of seeding. A determinate and a hybrid, the Early Wonder also matures quickly. Its short stature makes it suitable for small gardens, but because it's a determinate, it's unlikely to produce as much as the Early Girl variety. The Celebrity is also a determinate and a hybrid. This variety of tomato plant may take up to 70 days to mature, but produces large tomatoes that may weigh as much as 10 oz. Smaller than other hybrids are the Yellow Pear and Yellow Stuffer tomato plants. As their names imply, the tomatoes are both sunny yellow in color. Heirloom tomato plants have not been "developed"; that is, they grow naturally. They were not borne of cross pollinations or genetic manipulation. The seeds are harvested directly from fruits and the subsequent generations maintain the characteristics of the ancestral plants. Beefsteak tomato plants are heirloom, as are Cherokee Purple and Mexican Red. Brandy Wine, which exhibits a pale pink color, and the White Wonder, a cream-colored tomato, are also heirlooms. Heirloom tomato plants are indeterminate and tend to produce large fruit. Heirloom tomato plants, however, do not have the resistance to pests and disease that hybrids tend to have; the resistance is bred into hybrid seeds. Shelly McRae is a freelance writer residing in Phoenix, Ariz. Having earned an associate degree from Glendale Community College with a major in graphic design and technical writing, she turned to online writing. McRae has written articles for multiple websites, drawing on her experience in the home improvement industry and hydroponic gardening. What Are the Names of June Apple Trees?